Try the other word that the sound makes. Look for known parts and/or groups of letters. Break the word into parts (using affixes or syllables to guide you). Use context clues from the story and visual clues from the word. 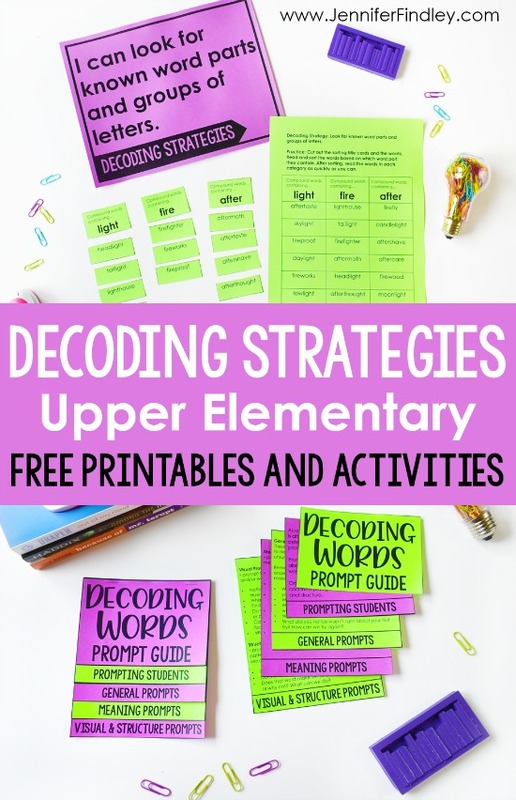 Now, let’s take a look at each one of those decoding strategies a little closer with tips for each one AND free activities to introduce these to your students. 1. Try the other word that the sound makes. For this decoding strategy, we look at long vowel/versus short vowel sounds, soft and hard letters, and vowel combinations that make different sounds (snow vs now). The initial instruction in this strategy is done through word sorts primarily. 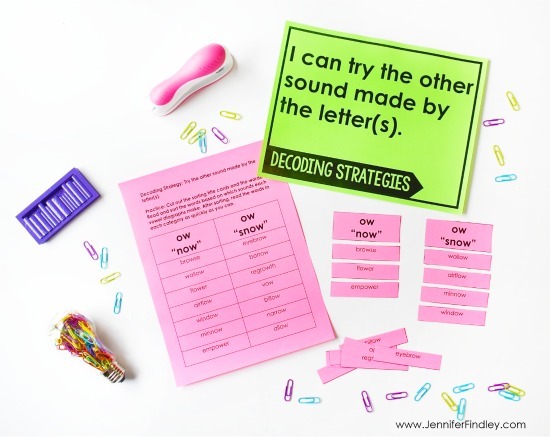 In the free download (available at the end of this post), I have included two introductory activities for this strategy: one involving sorting words based on if they contain soft g, hard g, soft c, or hard c and one involving sorting the two sounds of “ow”. As the students read and sort the words, have them play around with the two sounds to see which one is correct. 2. Look for known parts and/or groups of letters. 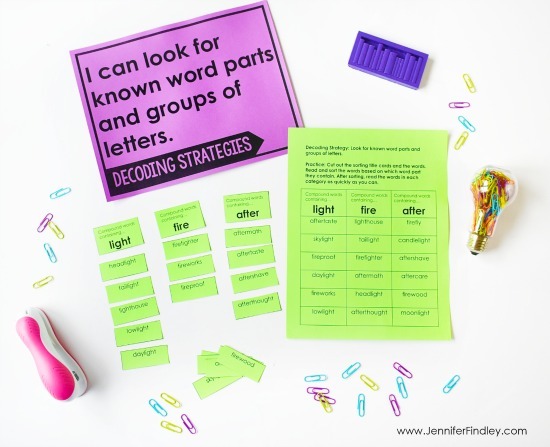 For this strategy, we do word sorts, short word lists, analogies, and just noticing and discussing words and their connection to known words. 3. Break the word into parts (using affixes or syllables to guide you). For this decoding strategy, my students tend to use affixes more as a guide. I have found that my students have limited to no instruction in syllables and not initially hearing the word makes syllabication difficult to use as a strategy. For this reason, we primarily focus on using affixes to help us break larger words up. We use word sorts (sorting by prefix or suffix) and a lot of isolating the different parts by circling the affixes. For the introductory activity, I provide words with simple and commonly known prefixes and suffixes. 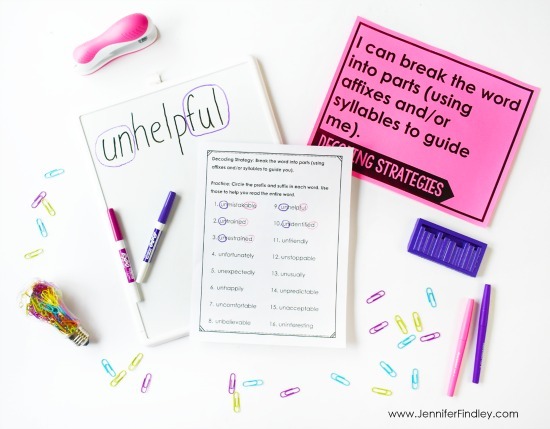 Using marker boards or simply writing on the handout, the students circle the prefixes and suffixes and then we use that to help decode the word. As they read the words, we discuss how breaking the word into parts helps efficiently read it (and determine meaning). 4. Use context clues from the story and visual clues from the word. This one is the trickiest decoding strategy to teach and introduce in isolation. For this strategy to work, the word must be in the student’s vocabulary BUT also be a word that they cannot decode automatically. This strategy is best introduced quickly and then practiced as the students read (by listening to them read and prompting them to use context and visual clues). To introduce this activity, I wrote a few sentences with words that I tried to match the criteria described above (in the students’ vocabulary but not a word they can decode automatically). For the most part, these words worked well with all of my groups. There were a few students that were able to decode 1-2 words automatically but we still did a check to make sure it matched both context and visual clues. This printable is also included in the free download at the end of this post. 1. Continue practicing the decoding strategy(s) with explicit instruction as needed with more sorts and activities. This can be as simple as writing words on index cards or making a list on a whiteboard. 2. Look for opportunities to explicitly apply the decoding strategies while reading common texts or guided reading books. This is important. If the students don’t have that ongoing exposure and application, they will not internalize the strategies. As you are planning your guided reading groups, strategy groups, or even read alouds in the days following the introduction of the strategy, actively look for words that you can model for the students how to use the strategy. Or pull the word out and have them practice the strategy prior to reading the selection. This part is crucial so the students see the relevance and connection between the strategy and their reading. If you miss this step, many students will likely not apply the strategy on their own. 3. Hold the students accountable for using the decoding strategies. This can be as simple as having them share after independent reading or guided reading. They could read the word or entire sentence and then explain which decoding strategy they used. 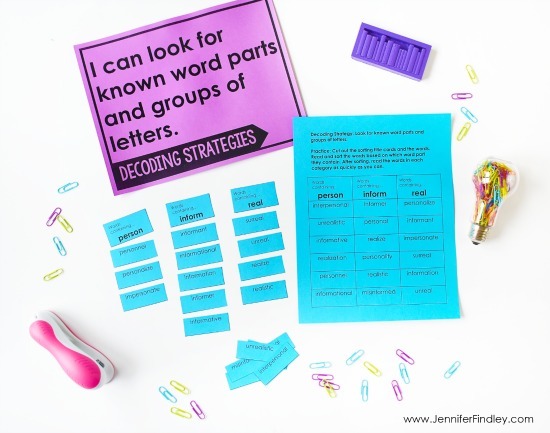 Do you teach these decoding strategies whole group or small group? Depending on the needs of your class, you can teach each as a specific mini-lesson in whole group or during small group. I personally prefer to teach these in a small group. 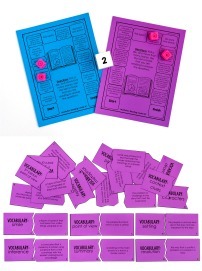 This way I can ensure that the students are applying the strategy to the activity and understanding the connection between the activity, the strategy, and how this will help them as they read. After you introduce the strategy and complete the introductory activity, what next? See the above section for the critical next steps to take to ensure the students find success with the decoding strategies. Doesn’t referring to these strategies take time away from their fluency? Yes, of course. The goal with any decoding strategies that you teach is automaticity but the students have to start somewhere. Giving them a guide to quickly look at will slow them down but will give them word-attack practice. Do you teach all of the strategies to all of the students? Only if they need all four. Some student will need all four strategies and some will already use a few of them and only need the ones they are missing. Listening to students read and noticing the decoding strategies they use (and don’t use) is critical to knowing which strategies to introduce to your students. 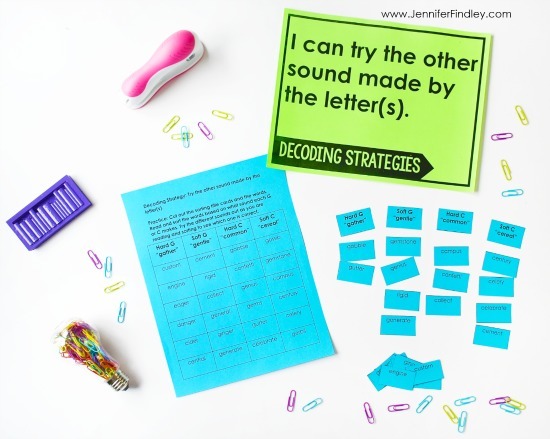 The informational and printables above are the decoding strategies I specifically teach and practice with my students. But, that is just the “first layer.” When I listen to my students read during guided reading or independent reading, I regularly prompt them as needed. This next section will share the specific decoding prompts I use with my students and how I decide which to use when. As a general rule, wait and see what the student is attempting first, and then use that to help you determine the next steps and how to further prompt the student. Prompt the student based on what he or she is already attempting and based on which prompt would work for the word. 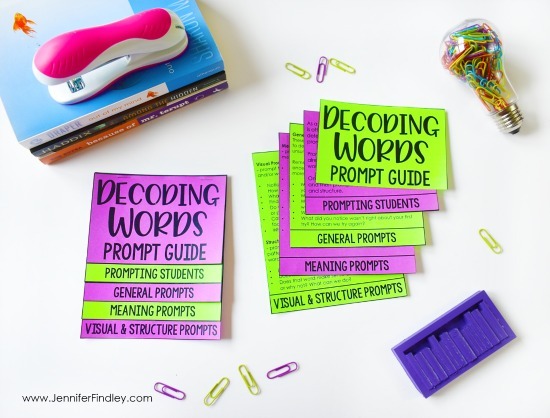 These are ideal to use if the student makes no attempt to decode the word on his or her own or if you are unsure which prompt would be the best to use. Remember that you may have to prompt more than once. I prefer to start with these prompts and then use more specific prompts as needed. What do you notice about the word that can help you? What can you use to help you figure out the word? What are you going to do to help determine the word? What word would make sense? What did you notice wasn’t right about your first try? How can we try again? Meaning cues – the students are using meaning and context to decode unknown words. The words may not “look” right but they make sense in the context of the story. Visual cues – the students are using the “look” of the word to decode it. The word may not make sense in the context of the story but it will use the same or similar letters and patterns. Structure cues – the students are using their knowledge of language and structure to decode words. The word they say make sense in the structure of the sentence. How does knowing this help you as a teacher? 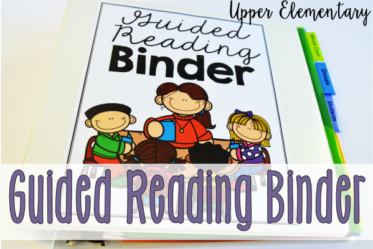 When listening to your students read or when completing running records, knowing what the students are using when they come to unknown words and what they are not using will help guide your instruction. For example, if a student uses visual cues only, you can provide instruction on making meaning and self-correcting based on meaning. You can also use specific prompts that prompt the student to use meaning cues. Identify which strategies each group needs more (meaning, visual, or structure). Stick to the prompts in those categories until you are comfortable with making these a regular part of your questioning technique. When planning your guided reading lessons, have the prompts handy and flag specific ones that will help your readers decode the words in the selection they are reading. Use what you notice the student already uses and does not use + the word itself, continue guiding the students to problem solve and decode the word. 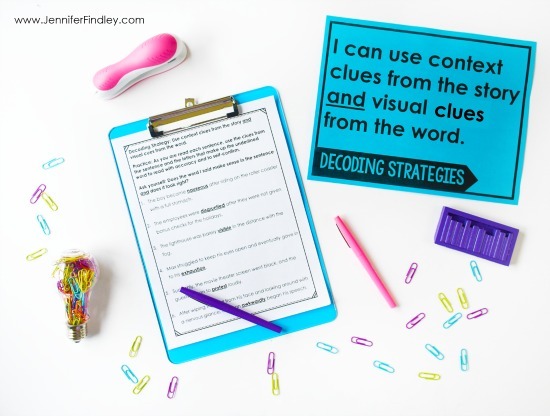 Click here or on the image below to grab ALL of the decoding strategy printables and decoding prompts shared on this post. Thank you so much for this decoding/prompting guide! It is hands down the best thing I’ve gotten online, and you offered it for free! 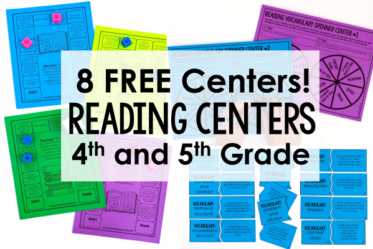 I’ve been looking for ways to boost my students’ reading strategies and many I’ve looked at are for younger students, or bundles that cost a lot. I know these are excellent and comprehensive prompts because of my intervention training (first year teacher). As a classroom teacher I juggle rigorous curriculum and teaching students who struggle to access it. I will be using these prompts and introducing these practice strategies the first day back this year! Thank you for your kind message! I am so glad you were able to find this resource. I hope it will be very helpful for you and your students! WOW, You are a very organized and hard working teacher! You should be the “New Teacher Orientation coordinator in your area! Thank you for sharing so generously! I have lost many sleepless nights trying to figure out much of what you have already done. We teachers are always reinventing the wheel! Thank you for getting me off the wheel.